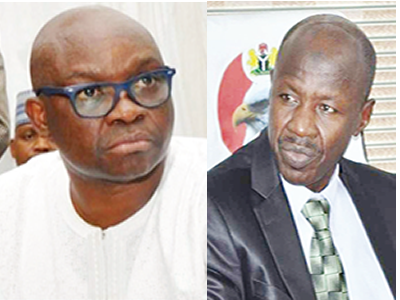 Ayodele Fayose, the Ekiti state governor, has accused the Economic and Financial Crimes Commission (EFCC) of coercing witnesses to implicate him, having been unable to establish any case against him. and or coerce Mr Maroun Azeez Mecheleb to make false statement to implicate me when he appears in your office at noon today (11/10/2018). The letter with reference number EK/Gov1/28/Vol1/13 read; “I have always been made to know that the statutory functions and powers of your Commission are neither to persecute nor compromise the integrity of your Commission. “Therefore, it is important to bring to your notice that I am aware of your desperate efforts in the last 48 hours to procure evidence by hook or crook to ‘nail’ me. “Specifically, I know as a fact that your Commission has been doing everything possible to induce and or coerce Mr Maroun Azeez Mecheleb Sam to make false statement to implicate me (when he appears in your office at noon today 11/10/2018) as a foundation for you to concoct trumped up charges against me notwithstanding the fact that the said Mr. Maroun who only returned to Nigeria in the last three weeks had earlier made two statements in Charge No. FRN vs. Abiodun Agbele and Ors. Copies extracted from the earlier proof of evidence are attached for ease of reference.